Palestinian and Israeli negotiations teams will be holding their sixth round of direct talks, on Tuesday evening [September 3 2013] in occupied East Jerusalem, again far away from the media.This round of talks is the sixth since U.S. Secretary of State, John Kerry, managed to get the two sides back on the negotiations table on July 29. 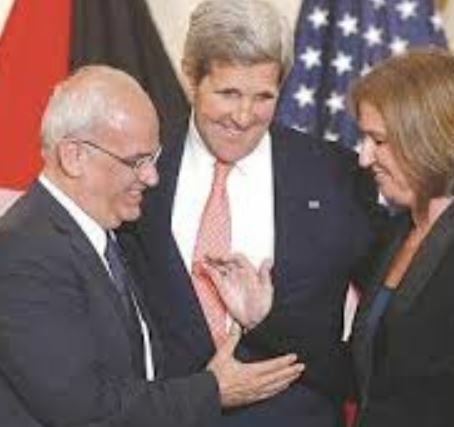 Israel daily, Haaretz, has reported that the talks are all behind closed, and that the Israeli side refuses to give any information on the talks, even info regarding technical issues. Last Saturday, Chief Israeli Negotiator, Justice Minister, Tzipi Livni, held a meeting with Chief Palestinian Negotiator, Dr. Saeb Erekat. Haaretz said that it remains unknown whether U.S. Envoy, Martin Endyk, will be participating in the sixth rounds of direct talks, especially since the only participated in one round of talks since direct talks were kicked off. Senior sources in Tel Aviv told Haaretz that the talks are still focused on the aim of these negotiations, mainly whether they are based on achieving an Israeli withdrawal from all territories Israel illegally occupied following the June 4 1967 war, with a limited land swap. However, Israel is trying to focus only on security arrangements in the West Bank, and insists that after security matters are concluded, talks on borders, and other issues, can be discussed. This is happening while Israel continues to approve thousands of units for Jewish settlers in the occupied West Bank, and in occupied East Jerusalem, in direct violation of International Law. A month ago, the Palestinian Census stated that, by the end of 2012, the number of Jewish settlers in the West Bank reached approximately (563.546) settlers, comparing to (538.781) settlers in 2011. This shows a %4.6 increase in the number of settlers in one year. Israel’s settlements are spread across the occupied West Bank and Jerusalem; they along with the Annexation Wall are turning the Palestinians communities into isolated cantons. The occupied West Bank is 5655 square/kilometers long, and 40-65 kilometers in width, while the Gaza Strip is 365 square/kilometers, 45 kilometers longs and 5-12 kilometers in width. The total size of the Palestinian territory is 6020 square/kilometers. Israel was established in 1948 on about %78 of historic Palestine, then after the war of 1967, Israel imposed its military occupation on the rest of Palestine and started building and expanding Jewish settlements considering them part of the state. Areas that the P.A “control” are around 210 square/kilometers, divided and largely surrounded in the West Bank by settlements and the Wall.